Frederick W. Brandt, Zion Lutheran Cemetery, Chattanooga, Mercer County, Ohio. This is the tombstone of Frederick W. Brandt, located in row 7 of Zion Lutheran Cemetery, Chattanooga, Mercer County, Ohio. 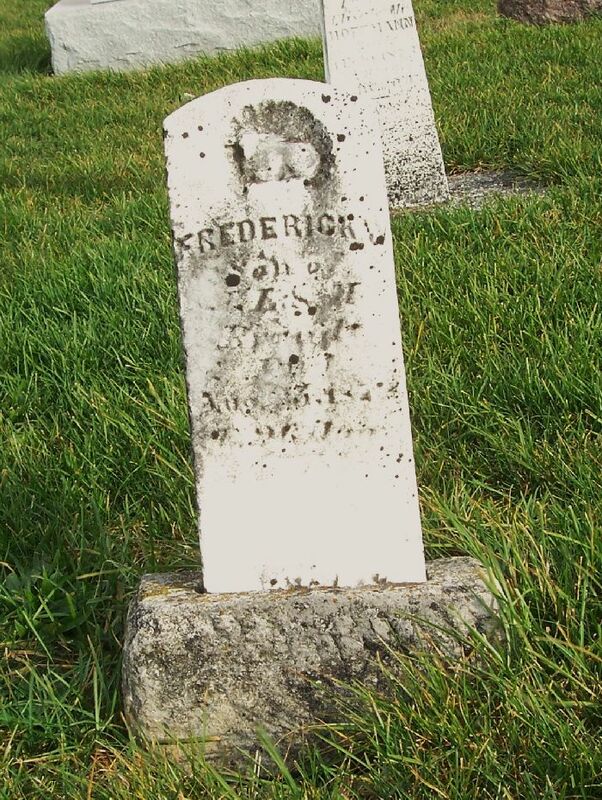 The marker is inscribed: Frederick W, Son of JL & M Brandt, Died Aug 25, 1872, Aged 26 days. According Zion’s church records, Friedrich Wilhelm Brandt was born 30 July 1872 in Blackcreek Township, Mercer County, the son of Ludwig Brandt and his wife Margaretha, born Haffner. The records state that Frederick’s father was born in Dietzhausen, Kingdom of Prussia, and that his mother was born in Mercer County, Ohio. The records also state that he was baptized 31 August, with his parents as sponsors, and that he died 25 August 1872, aged 26 days. He was buried on the 26th and his funeral text was Mark 10:14. Frederick’s baptism date was likely entered incorrectly in the church records because Lutherans do not baptize after death. I would guess that he was baptized on either the 31 July or 3 August. This portion of row 7 appears to be the children’s section of the cemetery.